A worn or damaged axle assembly on the front will make a clunking sound during low speed turns – often just when turning one way. A worn rear axle also makes noise, but may be more difficult for the driver to hear. Also, GRAND ISLAND car owners who see any oily leaks around their wheels should have it checked out at Whitaker Auto Repair. If you have a bad axle assembly, your service specialist at Whitaker Auto Repair in GRAND ISLAND can make the corrections. It is often more cost effective for GRAND ISLAND car owners to replace an axle assembly than it is to take it apart and rebuilt it. If you are hearing strange sounds coming from your front or rear wheel area, have your Whitaker Auto Repair service professional review your sedan. We can determine if it is an axle issue, or perhaps a worn steering, suspension, or brake component. 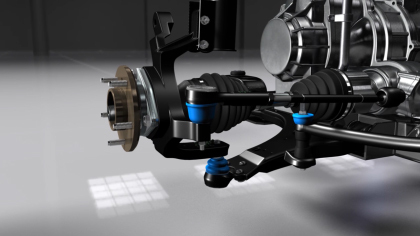 Your axles are the last link in transferring power from the engine to your wheels. They’re strong parts that last a long time – but they can run into trouble. There are different kinds of axles, each with their own potential problems. Your GRAND ISLAND NEBRASKA service technician knows this and checks for things like leaking seals, torn CV boots, worn axle joints. An inspection will reveal if there are any problems or if a part is nearing failure. When there is a concern with the axle shaft, it will be removed and inspected. If it’s damaged, the shaft will have to be replaced. If the shaft is in good shape, it’ll be cleaned, lubed and reinstalled. Damaged CV boots are replaced as well. It’s important to take care of this work as soon as you become aware of a problem. Waiting only makes the damage worse and more expensive to repair later. If the axle fails completely, it could lock up. This could severely damage other things like your transmission – very expensive. It could also contribute to an accident, which nobody wants.